Golem is the first fully decentralized computer network and a global marketplace for computing power. Golem connects computers in a peer-to-peer network and enables users to rent resources of other users’ machines. They can be used for computer graphics rendering, realistic simulations, machine learning, scientific calculations, and other resource-demanding tasks. Similar cloud computing services are offered by centralized cloud providers Google, Microsoft, Amazon, and IBM. Put differently, Golem is a global decentralized supercomputer network that congregates the processing power of computers on the platform. Like Uber or Airbnb, Golem empowers people to rent their spare resources. At the same time, anyone in need can speed up or perform heavy tasks which would otherwise be too hefty for their hardware. Such services are already offered by already existing cloud computing giants Amazon, Google, Microsoft, and others. Nevertheless, Golem hopes a peer-to-peer network incentivizing people to share and rent computing power would beat centralized services, offering cheaper, and more convenient services. What Problem Does Golem Solve? If it’s still difficult to see how leasing your computing power works, imagine the following post-production scene from any recent Hollywood blockbuster. They cost millions to produce, and a big chunk of production money goes to expensive CGI depicting breathtaking landscapes, dragons, superheroes, explosions, or other captivating effects. Fundamentally, they are created by the teams of artists. They design the characters, elements, objects, environments and plot out the motion. Afterward, they send the designs with further instructions to a cloud computing service, which renders everything. It means calculating all the tiniest pixels of the scenes to create stunning images we enjoy. Every particle, dust, light and other objects move on their own, so all their movements have to be calculated to an absolute precision to make up a realistic impression of a real world. It takes simulating the entire world within a computer, so rendering intense CGI scenes requires massive computing power. And that’s where Golem comes to play. Presently, Golem can assist anyone who works with graphics on any scale. Besides, anyone with spare computing resources can generate income. It’s estimated that an entire cloud computing market is worth nearly $130 billion. In the future, Golem plans to expand beyond graphics with machine learning being the next objective. How Does Golem Network Work? 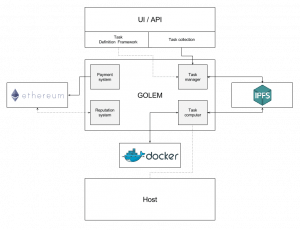 The Golem ecosystem revolves around the three types of stakeholders: resource requestors, providers, and software developers. Every one of them has different incentives to participate in the ecosystem. At the moment, Golem runs its first version for CGI computing only. It’s called Brass, and it supports two templates: Blender and Luxrender, which are two common open-source frameworks for making computer graphics. If you, for instance, need to render a beautifully animated scene made in one of these programs, then all you need to do is select the appropriate template, add all the necessary info into the task manager and send it to the Golem network. On the other side of the process, a resource provider retrieves all the available task offers and chooses the best one. Then, he or she replies to the proposal suggesting a price and relevant computing power info. If the conditions satisfy the requestor, the needed files are transferred to the service provider via IPFS, and the computing process begins. Once it is complete, he or she sends the outcome back to the requestor. In the final stage of the process, the task manager passes the information to different nodes for result verification. If all is well and good, the Golem payment system receives an order sent via Ethereum smart contract and executes the payment. Another integral part of the Golem network is the reputation system. It serves as a way to find and verify valuable and reliable network members and keeps the system fair and square. It uses measures like the accuracy of results or payment confirmation time and plays a crucial role in the Golem ecosystem where all network users have equal privileges. Besides the reputation system, other noteworthy Golem components include Application Registry and Transaction Framework. The Application Registry allows developers to publish their Golem dapps that help the network. 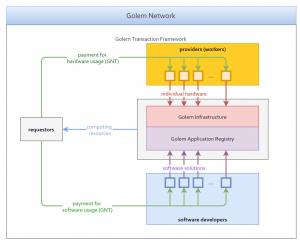 The Transaction Framework is a set of requirements every developer must meet when adding a transaction model in a self-made Golem application. It’s important to note upcoming versions of Golem will include the Task Definition Framework, which will allow the requestors to write their own code for specific tasks. Performing tasks outside of the predefined templates will only come in a later software version called Stone. 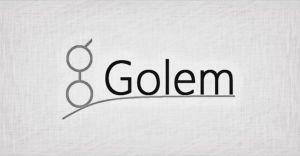 Golem team has over two dozen members and is based in Poland. The team is led by Julian Zawistowski, who is also involved with other blockchain platform Hoard. Most of the team members have a strong background in fintech. Golem launched in the second half of 2016, but it is said the founder Julian Zawitowski conceived the idea in 2014 when he got inspired by the potential of Ethereum blockchain. What is the Use Case of the Golem Network Token (GNT)? Means of payment to computing resource providers. Means of compensation for the Golem Network software developers. Upon integration of the Application Registry and the Transaction Framework, GNT will be used to pay for other interactions, too. Although Golem is issued on the Ethereum blockchain, it’s not an ERC-20 standard token. There are many ways to issue new tokens on Ethereum, and ERC-20 happens to be the most popular one. GNT does rely on the security and stability of the Ethereum network, but one just can’t assume every ERC20 wallet supports GNT tokens, so you should double check it every time. The circulating supply of GNT is 959,842,000 tokens. The total quantity is 1,000,000,000 GNT. Golem ICO took place in November 2016 and raised 820,000 ETH in less than 30 minutes. At the time it was worth nearly $8.5 million. A total of 820,000,000 GNT were distributed through the ICO, while the Golem project held other 120,000,000 GNT. 60,000,000 GNT were allocated for early contributors and team members. Both the Golem network and token supply are decentralized. More than 82% of the tokens circulate freely in the crypto space. Binance (paired with BTC, ETH, BNB). BitMart (paired with BTC, ETH). Liqui (paired with BTC, ETH, USDT). Upbit (paired with KRW, BTC, ETH). Bittrex (paired with BTC, ETH). OKEx (paired with BTC, ETH, USDT). ABCC (paired with BTC, ETH). Poloniex (paired with BTC, ETH, USDT). Huobi (paired with BTC, ETH, USDT). Ethfinex (paired with USD, BTC, ETH). Bitrue (paired with BTC, ETH). Bitso (paired with MXN, BTC). HitBTC (paired with BTC, ETH, USDT). Exmo (paired with BTC, ETH). Trade.io (paired with BTC, ETH). Koinex (paired with INR, XRP). BitBay (paired with PLN, BTC). CoinZest (paired with KRW, BTC, ETH). Gate.io (paired with BTC, USDT). The Golem project is keep being listed on new exchanges, thus look out for more trading pairs. GNT can be placed in most Ethereum wallets, including popular options like MyEtherWallet, Jaxx, Exodus or Trezor. Also, the tokens can be stored on Golem software, which acts as the official project wallet. It can be downloaded from the project website. The first version of Golem, Brass, was released in August 2016 as the MVP. Currently, it supports two CGI rendering tools - Blender and Luxrender. As of December 2018, the network is still in Brass Golem alpha testing phase and is geared toward CGI artists. Clay Golem. It introduces Task API and the Application Registry, which will make Golem a multi-purpose, generalized distributed computation solution. With Clay, developers may integrate dapps with Golem, but it’s likely such functionality will come at reduced stability and security. Regardless, it will enable new ideas, prototypes, and solutions to be built on Clay. However, at this stage, the project should still be regarded as an experiment. Stone Golem. It enhances the security, stability, and other functions implemented in Clay. Also, it will introduce the Certification Mechanism, which can be used to approve credible applications and the Transaction Framework. Such a function would allow Golem to be used in a SaaS model. Iron Golem. The Iron Golem will be a deeply tested secure and stable version of Golem which gives freedom to the developers. The apps will use the Internet connection and will run outside of the sandbox. The developers will be able to use numerous tools. Eventually, Iron Golem will implement Golem Standard Library - a functionality allowing interactions with Golem framework from within different programming languages, which will significantly increase potential Golem use cases. In the long run, Golem expects to become a prominent decentralized platform of microservices. Although to get to this stage, the project team also needs the simultaneous advancement of other related technologies, especially efficient data-sharing tools. Once the technology reaches the next level, Golem users will be able to run both small (e.g., note-taking app) and large (e.g.. a streaming service) applications in a decentralized fashion. Despite the ambitious nature of the project, some project fans came to dislike it due to the slow-moving development timeline. 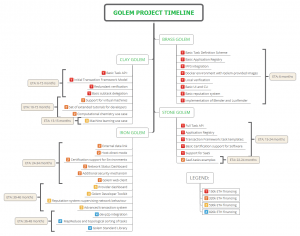 The team avoids giving specific roadmap dates for the project upgrades and says that the next release will come out “as soon as it’s ready.” Other Golem community members argue this approach is mandatory for a project of such magnitude. iExec (RLC) - A distributed applications, data sets, and cloud computing platform on the blockchain. SingularityNET (AGI) - A decentralized marketplace for AI. DeepBrain Chain (DBC) - Decentralized AI computing platform built on NEO protocol.